While trying to decide which ghost photos are the “best” is largely an exercise in subjectivity, it’s difficult to know which ones are the best with any degree of objectivity. These are the photos I consider the most authentic “captures” of ghosts ever caught on film, but I leave it to you to decide for yourself how real they may be. Of course, I realize that almost any photo can be hoaxed, but many of these were taken many years or even decades before digital cameras and the advent of Photoshop and other photo manipulation software came on the scene, making them somewhat more difficult to fake than it would be today. Taken in 1946 in Queensland, Australia by a mother who was taking a picture of her teenage daughter’s grave. 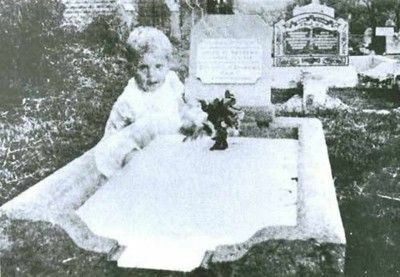 Nobody was in sight at the time, but when the picture was processed the image of a child appeared, apparently sitting on the grave. The mother does not recognize the child, thereby reducing (though not entirely eliminating) the possibility that it’s a double exposure. This famous photo taken in 1924 apparently shows the faces of two recently deceased crewmen appearing in the waves alongside the merchant ship S.S. Watertown. Normally I’m not a big fan of faces appearing in grainy photos due to the brain’s tendency to make order out of chaos (known as “matrixing”) but this case is different in that the faces were seen by numerous members of the crew for several days beforehand and were positively identified as those of two crewmen who suffocated while cleaning out an oil tank a few days earlier. The Burns Detective Agency analyzed the negative for fakery and found none. This famous photo of a young girl looking out from a raging fire was taken during a 1995 structure fire at Wem town hall in Shropshire, England. Shot from across the street by a local photographer, nothing unusual was seen at the time but once the negative was developed he noticed what appeared to be a young girl standing in the doorway of the burning building. Firemen found the photo so disturbing that they sifted through the ashes afterwards searching for the remains of a body but found nothing, leaving everyone wondering who the girl may have been. Not surprisingly, there is a bit of local folklore which claims that a young girl named Jane Churm accidentally burned the town hall to the ground in 1677 when she dropped a candle, and her ghost has been reputed to haunt Wem town hall ever since. Once a firebug, always a firebug I guess. One of those “too-good-to-be-true” photos, this one actually has a pretty good pedigree because it was shot by a professional paranormal investigator (and notice it was also taken in broad daylight, as opposed to most cemetery investigations which are almost always shot at night). 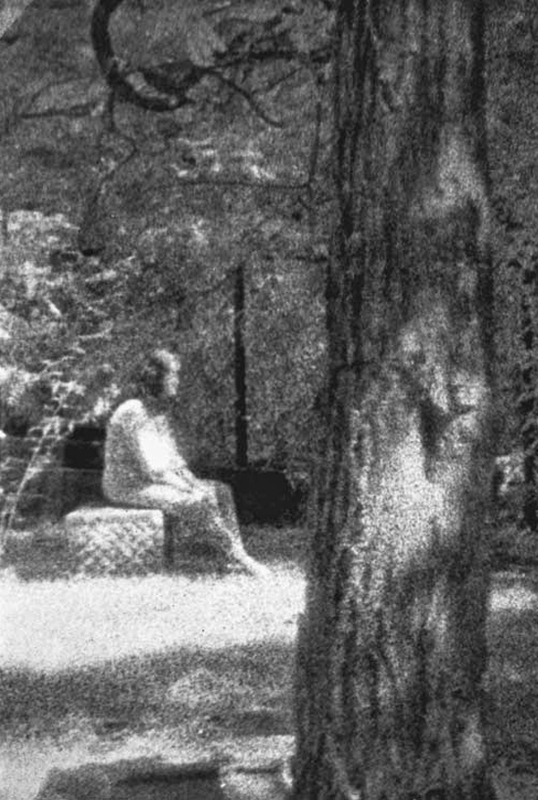 The picture was taken at the Bachelor’s Grove Cemetery in Illinois by the Ghost Research Society on August 10, 1991. Photographer Mari Huff was using high-speed monochromatic film in the area where their equipment had detected several electromagnetic anomalies, and captured this image of a woman in period costume—complete in a burial shroud of the era—sitting on a gravestone. Note that parts of her lower legs appear to be transparent. Looks staged, I know, but then what’s a real ghost supposed to look like? Taken by Reverend R.S. Blance at Corroboree Rock near Alice Springs, Australia in 1959, this famous photo has been around for many years and defies explanation to this day. It wouldn’t be difficult to fake this photo with modern photo manipulation software (i.e. Photoshop) but it would have been nearly impossible to do in 1959. Another classic and one of the better captures, this photograph from 1919, taken by retired RAF officer Sir Victor Goddard, shows his squadron from the Royal Navy vessel HMS Daedalus. Notice the transparent face peering around the man in the upper left corner of the photo. Several men from this squadron identified the face as belonging to mechanic Freddy Jackson, who had been killed two days earlier when he accidentally walked into a spinning propeller blade. His funeral had taken place earlier that day. Apparently, Freddy didn’t want to miss all the fun. This shot has one of the best pedigrees among spirit photos because it was shot under carefully controlled circumstances with numerous witnesses present, making fakery especially difficult. 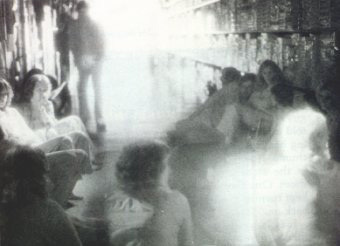 Taken in 1978 at a Sunnyvale, California Toys-R-Us store known for an inordinate amount of paranormal activity, the picture was shot by the crew from the TV program That’s Incredible! The infra-red film image of the young man leaning against the wall was NOT seen by any of the people present at the time, nor does he appear in the high speed footage shot from the same vantage point at the same time. There’s a story that in 1869 a young man died at the location where the store now stands from a accidentally self-inflicted axe wound, which might explain his unusual clothing. This well known photo—and perhaps one of the oldest examples of a bonifide spirit photo—was taken in the Combermere Abbey Library in 1891 by Sybell Corbet. The exposure length was approximately one hour, and the figure of a man appears to be sitting in the armchair located in the foreground (it’s difficult to make out, but a head and arm can just be made out sitting in the chair). At the time this photograph was being taken, Lord Combermere (a top British cavalry commander) was being buried four miles away and the house was said to have been locked and empty at the time. Additionally, those who knew Lord Combermere claim the figure looks exactly like the man, so we have to wonder if the old gentleman wasn’t simply just visiting his old “haunt” one last time. 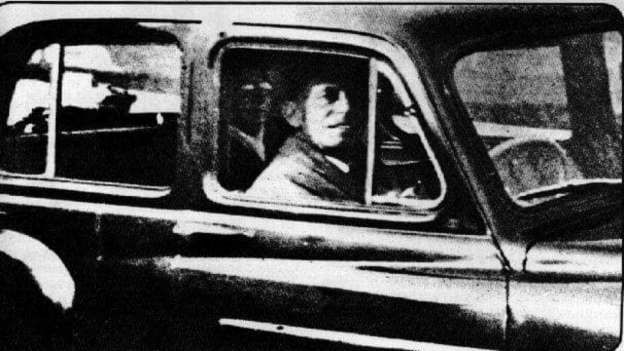 When visiting her mother’s grave in 1959, Mrs. Mabel Chinnery decided to finish off the roll of film by taking a picture of her husband seated in the car. When the roll was developed, a female figure appeared, sitting in the back seat. Mrs. Chinnery and several family members insist that the female figure is that of her mother, who appears to have taken her customary place in the back seat and is patiently waiting to be driven home. A photographic expert examined the print and declared it to be neither a reflection nor a double exposure. Notice that “mom” appears to be a pretty solid ghost, with no hint of transparency or light from the rear windows shining through her. Even her glasses appear to reflect light! Perhaps the most famous of all ghost photos, this highly controversial shot was taken in1936 by photographers sent by the London magazine Country Living to take some interior shots of Raynham Hall in Norfolk, England. What’s also interesting about this shot is that in contrast to most photos in which the figure is not seen until after the film is developed, the spectral figure of a woman descending the stairway was seen seconds before the gshutter was snapped. The negatives on this photo have been scrutinized by literally hundreds of experts (and no small number of skeptics) who can find no evidence of it being either a hoax or a double exposure. Still considered by many to be the best “capture” ever taken. Just read a great investigative article on the Watertown photos. Upshot is that the faces are pasted in, and extra stanchions are pasted in over the cut lines. A little airbrushing to provide continuity with the waves, and there you have it. Instant ghost faces. By the way, the author of the article found the original specs for the tanker, and calculated that the faces would have each been as large as a full-grown person. i’m not an expert on photos or anything, but some of them are interesting for sure. A photo that didn’t make the list that I always found intriguing was one taken by Harry Houdini at a lady’s funeral. He made a career out of debunking the “paranormal,” and apparently this was the only time he could offer no explanation. Supposedly they had ruled out the possibility of human/camera error for some reason. i believe that theres something like a ghost, maybe just energy, but these pictures do not show me anything. specially because if you notice it, some of them are picture of stuff like a set of stairs. or a tree (not even a nice tree), it just seems like they were taken to be photoshopped.. or an old school version of photoshop. In number three, how could somebody take the photo if the house was empty? And why would somebody take a picture of an empty chair. In these times, with all the people carrying camera phones, you would think there would be more ufo and ghost pictures. Actually it’s realllllly easy to fake these photos now AND back then. Ever wonder why people didn’t used to smile in their photos? It’s because primitive cameras took a long time for film to register the light that creates a photo. People didn’t smile because it was hard to hold it for the minute or two while their photo was taken. If you DID move in one of these photos it would create a blur or a shadow or faint image or a person. Search how to make a coffee can camera and you can EASILY do this yourself. You can create really cool images (with the right tools, you will need access to a dark room) that look extremely ghosty. I want to believe in ghosts but until one kicks me in the face I’m not going to. The #1 photo is a double exposure of a statue of the madonna. To the people that took the time to write out reasons why EVERY photo on this list is bogus, is it so difficult to believe that not everything can be a coincidence? If something is occurring and being witnessed by a lot of people in a lot of places, it can’t all be a hoax that people make up for a laugh. I’m not particularly spiritual, but I think if so many people have personally witnessed ghost activity, then it couldn’t all just be a coincidence. At least, it would be a very elaborate and unlikely coincidence. Argument Ad Populum is invalid. Rememebr people are witnessing different things and assuming they are all the same, there are many descirptions of ghosts many that contradict and also change over time- Victorians saw ghosts in white sheets, today we see ghosts in full clothes. A billion people can be wrong. One of the main reasons for rejecting ghost photos is ebcause it is assumed that ghost, if they exist, can be captured on film but strangley can’t be seen with the human eye. Rememebr, even if we can find NO natural rational answer for an occurence does not mean it is supernatural, it just means its unexplained. i saw the pictures,well.. interesting ! but it’s more interesting when i saw people are hardly argueing about it. calm down my friends,just enjoy it,don’t make it hard for your self !! 10-fake-you can clearly see the arm of an adult around the baby. 3-false positive. The exposure on this photo was an hour long. I think that “Brown Lady” is the most authentic photo of ghosts. Others are great too but I’m not so sure about some of them. Some look like fakes for me, I don’t know. But they surely look more real than most of “real ghost photos” taken with digital cameras and photoshoped. Nice list and nice article. In my opinion, some photos from this article are fake. The only one which I think is authentic is The Brown lady. Do modern day cameras scare away ghosts?? who ya gonna call, ghostbusters! # 10 is the most unbelievable photo!!! how dare you use this child freak everyone! it’s obvious.. The 5. 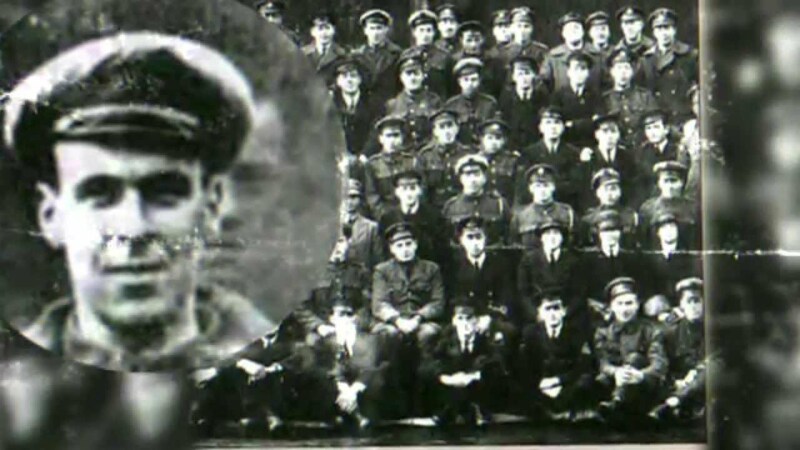 HMS Daedalus Photo, 1919, is very easy to explain: The man in the background is not Freddy Jackson. Because there was no Freddy Jackson. The story was created after the photo was taken by a man who thought the “ghostly” face would make a good yarn. The photo is genuine, to be sure. But it’s a genuine photo of people who were all alive. Research it if you don’t believe me. Interesting coincidence regarding photo number 5 re Sir Victor Goddard’s photo of Freddy Jackson. I have unearthed an old photo album which contains several original photos of Sir Victor Goddard on a sailing trip on the Norfolk Broads in England with 2 friends in September 1913,6 years before he took the famous Freddy Jackson photo. On one of the album pages there are 2 nearly identical photos of Victor sailing a yacht.The photo on the left has the top of his head cut off and the photo on the right is as it should be.His friend who took the photos must have realised that he had missed the top of Victor’s head and took the other photo seconds after.There is a gap between the photos in the album page where Victor has written.. ‘advt.Try ‘Killum Kwik’ for the hair.Gives a luxuriant growth after 1st application.Mr R Victor Goddard the World’s great Adonis writes.I was bald(in photo 1)and had tried all remedies but with no success.3 minutes after the first application of your wonderful ointment I became(as in photo 2)with parting complete! I believe Sir Victor was 16 years old when writing the entry in the album in 1913. I am in no way suggesting that the Freddy Jackson photo could be fake but only dislosing that Sir Victor Goddard had a connection with an interesting photo of a head in the past and in this particular case it was his own!Ijust think it’s a strange coincidence. i can fake the brown lady with a modern camera no photo editing.All you have to do is take a clear peace of plastic like the plastic on the little paper DVD envelopes or the wrapper that you take off a new CD and take a marker of what ever color to draw a person on the little plastic peace.Take out your cell phone, put the plastic over the lens , adjust your ghost and take a picture.Now you have a creepy looking shadow ghost picture! There will always be argument about whether photos like these are genuine or not. That fact alone means some may be genuine. Consider the following too. What if number 10 was a double exposure that wasn’t deliberate? Seems even more beyond our comprehension and frightening. What if some of the photos are paraeidolia? Even if a pattern in something does look like something or somebody it’s inexplicable and beyond our comprehension. What if something is a trick of light or reflection? Still just as frightening if it’s not deliberate. Coincidence itself can be just as spooky. These are just some of my thoughts. I think that whether you want to prove something or disprove it, it’s the argument (and coincidence) that makes the paranormal topic so frightening. Double exposures have been around since the invention of cameras. So have cut outs pasted onto photos and re-photographed. Everything I saw could have been produced by accident easily. This collection of pictures does not convince that ghosts exist. The only people who don’t believe is the ones who has not experience any thing or has not paid attention. I have saw and experience such. There are ghost or spirits….If you believe it or not. #8 Wem fire. I found the web page with the ghost photo and an old Wem postcard photo side by side (the accompanying article suggest the girl in the postcard was used to fake the girl in the fire). I copied both image and brought them into photoshop, overlaying one on top of another. They are an exact match. The fakery became even more clear when I adjusted the contrast and brightness of the ghost photo. 8. Smoke/ash, but admit it appears eerie. Freak shape like clouds. 4. Gimme a break, the dude’s wearing flared pants as they did in the late 1970’s. 3. Exposure 1 hour?? Anyone could have sat for a spell and then gotten up. And a big tip off to these fakes is – why take such a picture of an empty chair?? Think about why the pic was taken. 2. Look closer could be shade/shadows. 1. Debunked. Immaculata statues of Madonna standing on globe popular then. Look at bottom of Brown Lady. some of you say that thare is no gost but thare is I have sean thim for my self I sean one going in and out of A fireplace I was abut 20ft Away and it did not hert me this whos abut wen I was 15y old and after that I started seeing things and feling things I thot that I was going nuts I realyed that wen Iem In right place I can reach out and tuch thim and it is cold but thay do not try to hert me Ithink wen I ask thim to move something like A ball some times thay can A fuw of my frends have seen me work whith thim I like being A rond thim ? I have A recorder and I have pick up that will amaze you but wen you hear A lot of nois that is staic but wen you can hear A voice that makes it the best thing of ALL. I know I lived oh for12ys ago I told thim that I wood go in to cheack things out and I did thay seed that A man dyd in the bldg from A rope back in the 40s I sead ok wen I took in A evp meatr and A recoder and A nitevison I started asking thim to come forth and wen Idid I herd 8 difaret sonds comeing in side the bldg I now thay were trying to get my atenchin I hade the hare stanup on my arms thats wen I now that thay where close to me I like that fealing thay are trying to cotack some one so wen you see some thing that you can knot explane stop look some one mite be trying to get in tuch whith you.??!. I think that most of the photo’s are just transfer from photo’s previously taken, either by previous or current longer exposure, I guess. One should have a full examination report on each one of them to know. All but the Brown Lady (#1) are very questionable and some have been proven fake.